This 50-pc. 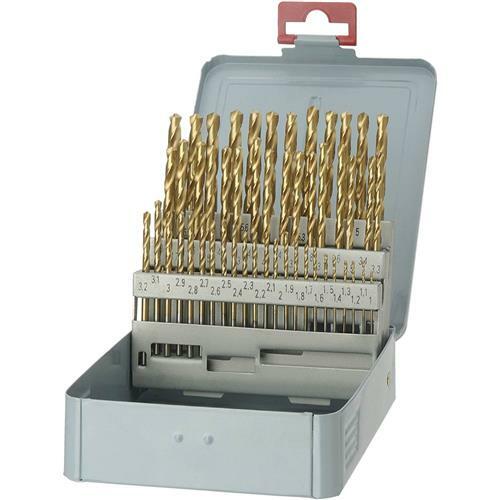 Metric Drill Set is Titanium Nitride coated high speed steel for toughness and long service life. Includes 1mm through 6mm in .1mm increments plus steel index. I have been looking for such a set of metric drill bits for along time. For some reason none of the national hardware and home improvement stores seem to carry metric drill bits. They all carry metric wrenches and even tap and die sets but not drills. Even the Chinese companies that have metric sets seem to only carry ones with .5 mm spacing. Grizzly is the only place I have found the set with 0.1 mm spacing. This set has been incredibly handy for my model building and 3D printed projects. I am super pleased with this set and it comes with a very nice metal drill index. Thanks Grizzly! I found that a set of metric drills is not easy to come by. This does the trick for me. I am thanking Grizzly for stocking this item. Quality seems very good. Bought for special project - exactly what was needed. I bought these about 2 months ago. The only thing bad I could say is that one of the bits was missing from the drill bit box. However the bits seam to do a really good job. I bought this set in July, when it was on sale, but out of stock. Finally received it in November, and have taken advantage of having such a span of sizes in .1mm (.004") increments, as well as being able to get within .002" of any size hole I need in the 50-drill range. Smaller measurements are unrealistic in a home workshop. Glad I bought this drill set. Great company and great products. I will be ordering a mill this summer from Grizzly.